A selection of arrangements of the some of the greatest tunes ever written by the guitarist that brought you "LJ Plays The Beatles" , "One Wing" and "the Pink Panther Theme" from the GRAMMY winning Henry Mancini : Pink Guitar CD!!! 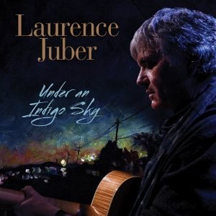 Although an accomplished composer in his own right, Laurence Juber has recently gained much attention for his fine interpretations of Beatles and Paul McCartney's music. Here he focuses on the music of an earlier era, arranging and playing some of Harold Arlen's most well-known tunes. This music is structured quite differently than pop music from the 60s and 70s, yet that poses no problem for Juber. Although he included jazzy voicings in "Rules of the Road" and in a number of other originals and covers, here he digs in and offers a bluesier, more soulful listening experience than just about anything he's done previously. He typically plays at least two variations on each verse and bridge, changing tempos, reharmonizing, adding walking bass lines, tenths and tasty single string runs. "I've Got the World on a String," "If I Only Had a Brain," and "It's only a Paper Moon" are mid-and uptempo showcases for the octave runs, bass lines and other stylistic devices that Juber often employs. "The Man That Got Away" is played with a bossa nova feel that propels the torch song in a completely new way. Some slower tunes, such as "Stormy Weather," "Any Place I Hang My Hat is Home" and "Come Rain or Come Shine," display his bluesy side to best advantage. 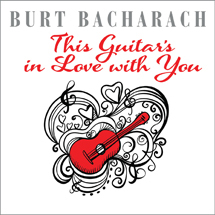 Harold Arlen's chord progressions, strong melodies, and even the history of this material combine to inspire and unleash Juber as nothing else has previously; while the performances certainly retain his identifiable stamp, Laurence Juber has clearly achieved a new level of expression in this collection. "I've Got the World on Six Strings" should please his existing audience, attract new listeners and challenge steel-string fingerstyle guitarists to explore the music of Harold Arlen and his cohorts, including Cole Porter, Hoagy Carmichael and George Gershwin, whose work comprise the Great American Songbook. put this address into your browser and enjoy! 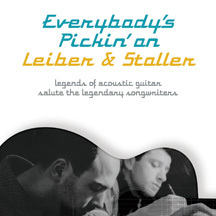 Laurence Juberâ€™s latest solo fingerstyle release is an ambitious tribute to composer Harold Arlen. Even if you donâ€™t recognize the name, youâ€™ll certainly recognize the Arlen tunes Juber has chosen, from Wizard of Oz favorites like â€œOver the Rainbowâ€� and â€œIf I Only Had a Brain,â€� to classics like â€œStormy Weatherâ€� and â€œItâ€™s Only a Paper Moon.â€� Juber updates these tunes with his distinctive touch and signature sound while at the same time respecting and maintaining the integrity of the original melodies. 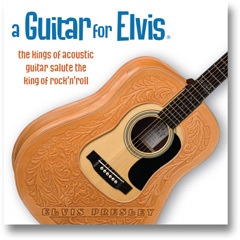 Some tunes are upbeat and snappyâ€”â€œBetween the Devil and the Deep Blue Seaâ€� features a funky tapped-octaves bass line in the same vein as Juberâ€™s own â€œRules of the Roadâ€�â€”while others, like â€œAnyplace I Hang My Hat Is Homeâ€� and â€œStormy Weather,â€� are slow and bluesy. Juber again demonstrates his mastery of D A D G A D tuning, which he uses for more than half the tracks, as he navigates through complex harmonies with sophisticated jazz-chord voicings. A book of transcriptions is reportedly in the works, but for now, guitarists can learn a lot simply by listening to how a master arranger interprets this collection of classic tunes. 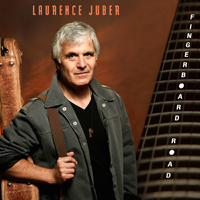 Although best known as lead guitarist of late-era Wings with Paul McCartney, Laurence Juber has quietly become one of the outstanding finger-picking acoustic guitarists on the planet with a series of recordings he has made over the past 10 years or so. His latest brilliant outing is a study of the works of composer Harold Arlen -- everything from "Over the Rainbow" to "Come Rain or Come Shine" -- who, for some reason, Juber considers underappreciated. He gloriously articulates the melodies and never succumbs to show-off playing. But the notes spin out of the songs with such finesse and musical agility, it's hard to believe he has only 10 fingers and six strings. 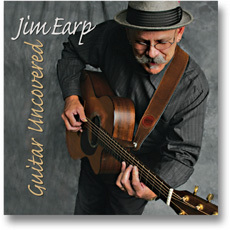 Juber has made a rare acoustic guitar record with bark and bite. His playing is just short of sleight of hand and, like all magicians, he makes it seem effortless. 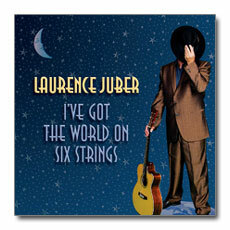 Laurence Juber I've Got The World on Six Strings? interpretation on a showcase of The Great American Songbook.